Tata DOCOMO the GSM mobile service operator today rationalized its existing GPRS Packs and announced an aggressive offer on their GPRS plans for prepay customers across the Tata DOCOMO network. Considered to be the industry best and competitive in nature the all new GPRS packs are priced at a nominal cost bundled with high data usage. GPRS package offers 5 different tariff plans from lowest of Rs. 5 to a maximum of Rs. 95 to suit varied needs of the customers. 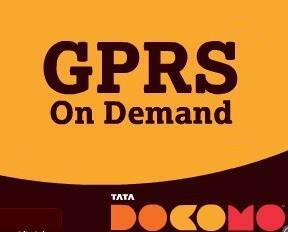 Tata Docomo GPRS packs are available in five denominations. With GPRS pack of MRP of Rs 5, subscribers can avail 10MB free usage till midnight on the day of recharge, GPRS Pack for Rs 15, allows subscribers to avail 500MB free usage with a validity of 3 days. While the GPRS pack for Rs 33 is a night pack designed to cater to night surfers that offers free usage of 1GB for 30 days from 11pm to 7am, GPRS pack available at Rs 48, under which subscribers can avail free usage of 2GB for 30 days and GPRS pack for Rs 95 provides subscribers free data usage of 6 GB for 30 days. After using the free data usage, customers will be charged a nominal rate of 1paise/20KB. or easy use and convenience prepay customers can opt for Rs. 5 & Rs. 15 GPRS packs through SMS. To subscribe for Rs 5 pack through SMS prepay users have to type GPRS and send SMS to 121 and for Rs. 15 pack, type GPRS15 and send SMS to 121. Are these plans available in maharashtra circle or not?? ?